Thousands, their arms linked in a show of unity, are about to start marching from the Kampung Baru mosque towards the Petronas Twin Towers, shouting "Turun harga" (down with prices), "Turun minyak" (down with petrol), "Turun BN" (down with BN). The police have yet to make any move to break up the assembly. The security forces, with shields up, are keeping a close watch. One agitated protestor was heard shouting for Pak Lah to step down, calling him a "paling penipu" (liar who lies the most). 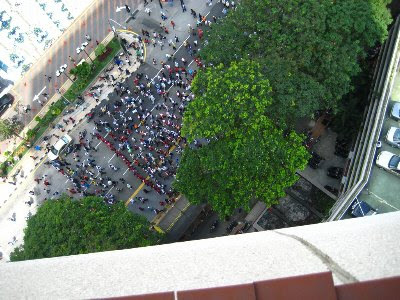 Malaysiakini estimates the size of the protest crowd to be roughly 1,000. Started just half an hour ago, the protestors had to take a different route to KLCC because of the FRU's (Federal Reserve Unit) intereference. Thousands of protesters, six-car lanes wide and about 100 metres long, are now on Jalan Tuanku Abdul Rahman heading towards the Petronas Twin Towers. The road has been closed to traffic. The police are keeping a close watch of the situation and have yet to make any move to break up the assembly. A police helicopter is also observing the proceedings from the sky. 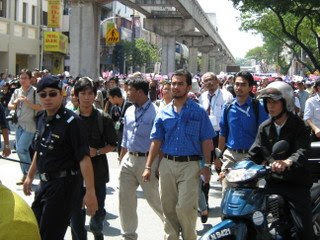 Malaysiakini now reports that the opposition-led protestors are avoiding any confrontations with the police. Hundreds of people are staging a sit-down protest in front of Sogo departmental store. As usual, it's going to be a game of cat and mouse between the protestors and the police. Malaysiakini now revises the number to 2,000. Police have indicated that no arrests will be made so far, since after marching to PAS' headquarters in Jalan Raja Laut it is believed that the protestors will disperse there. "The leaders of BN are living off the backs of the rakyat," one protestor was heard shouting. Heavy police presence prevented protesters from proceeding to the KLCC as planned so the back-up end point is now Sogo in Jalan Tuanku Abdul Rahman. They are heading back to the PAS office in Jalan Raja Laut. PKR Youth chief Shamsul Iskandar says they are hoping to collect 1 million signatures ahead of the July 5 protest which is to be the biggest in Malaysia. As of today, they have already collected 10,000 signatures. They want the fuel prices to go back to pre-hike level. At a press conference after the protest march, it was announced that the Pakatan Rakyat roadshow to protest the fuel hike will kick off this Sunday in Penang at the Stadium Bandaraya. All the Pakatan leaders will be there including Anwar Ibrahim. KUALA LUMPUR: A large group gathered in front of the Kampung Baru mosque after Friday prayers to protest the recent fuel price hike. 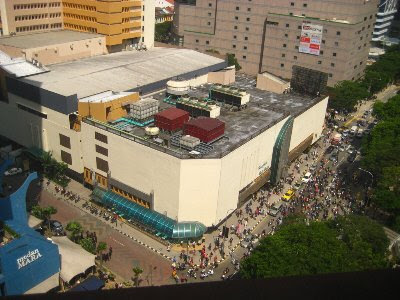 The group marched towards the junction of Jalan Tuanku Abdul Rahman and Jalan Dang Wangi in front of the Sogo shopping complex. They then sat on the road for a few minutes before moving on to the PAS headquarters on Jalan Raja Laut. A total of 889 police personnel stood watch but did not confront the crowd for fear of provoking unruly behaviour among the demonstrators. The crowd dispersed at about 3.15pm shortly after reaching the PAS headquarters. Earlier it was reported that about 2,000 police officers and FRU personnel were deployed near Kampung Baru and the Kuala Lumpur City Centre ahead of the anticipated fuel price hike rally organised by PAS.